Campania ([kamˈpaːnja]) is a region in Southern Italy. The region at the end of 2014 had a population of around 5,869,000 people, making it the third-most-populous region of Italy; its total area of 13,590 km2 (5,247 sq mi) makes it the most densely populated region in the country. Located on the Italian Peninsula, with the Mediterranean Sea to the west, it includes the small Phlegraean Islands and Capri for administration as part of the region. 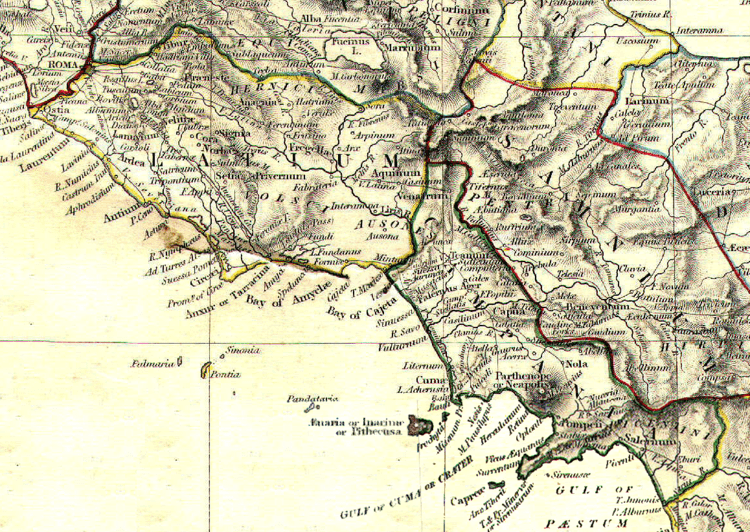 Campania was colonised by Ancient Greeks and was part of Magna Græcia. During the Roman era, the area maintained a Greco-Roman culture. The capital city of Campania is Naples. Campania is rich in culture, especially in regard to gastronomy, music, architecture, archeological and ancient sites such as Pompeii, Herculaneum, Paestum and Velia. The name of Campania itself is derived from Latin, as the Romans knew the region as Campania felix, which translates into English as "fertile countryside". The rich natural sights of Campania make it highly important in the tourism industry, especially along the Amalfi Coast, Mount Vesuvius and the island of Capri. The original inhabitants of Campania were three defined groups of the Ancient peoples of Italy, who all spoke the Oscan language, which is part of the Italic family; their names were the Osci, the Aurunci and the Ausones. During the 8th century BC, people from Euboea in Greece, known as Cumaeans, began to establish colonies in the area roughly around the modern day province of Naples. Another Oscan tribe, the Samnites, moved down from central Italy into Campania. Since the Samnites were more warlike than the Campanians, they easily took over the cities of Capua and Cumae, in an area which was one of the most prosperous and fertile in the Italian Peninsula at the time. During the 340s BC, the Samnites were engaged in a war with the Roman Republic in a dispute known as the Samnite Wars, with the Romans securing rich pastures of northern Campania during the First Samnite War. The rest of Campania, with the exception of Naples, adopted the Latin language as official and was Romanised. 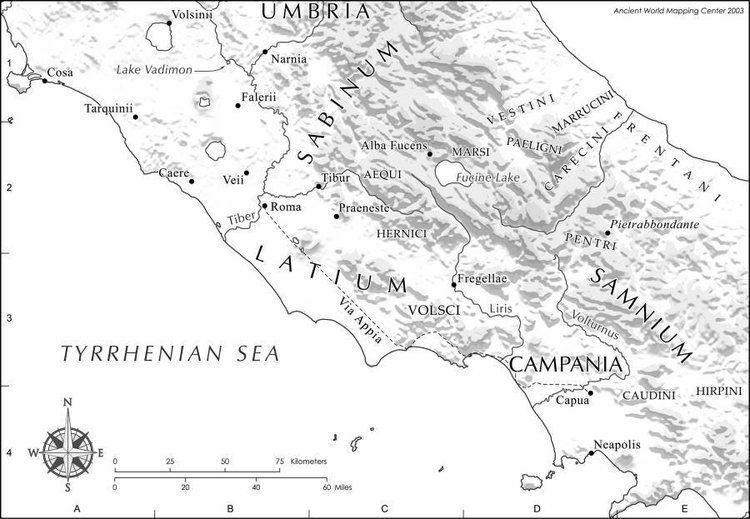 As part of the Roman Empire, Campania, with Latium, formed the most important region of the Augustan divisions of Italia; Campania was one of the main areas for granary. Roman Emperors chose Campania as a holiday destination, among them Claudius and Tiberius, the latter of whom is infamously linked to the island of Capri. It was also during this period that Christianity came to Campania. Two of the apostles, St. Peter and St. Paul, are said to have preached in the city of Naples, and there were also several martyrs during this time. Unfortunately, the period of relative calm was violently interrupted by the epic eruption of Mount Vesuvius in 79 which buried the cities of Pompeii and Herculaneum. With the Decline of the Roman Empire, its last emperor, Romulus Augustus, was put in a manor house prison near Castel dell'Ovo, Naples, in 476, ushering in the beginning of the Middle Ages and a period of uncertainty in regard to the future of the area. The area had many duchies and principalities during the Middle Ages, in the hands of the Byzantine Empire and the Lombards. Under the Normans, the smaller independent states were brought together as part of the Kingdom of Sicily, before the mainland broke away to form the Kingdom of Naples. It was during this period that elements of Spanish, French and Aragonese culture were introduced to Campania. The agro-food industry is one of the main pillars of industry of Campania. The organisation of the sector is improving and leading to higher levels of quality and salaries. Campania mainly produces fruit and vegetables, but has also expanded its production of flowers grown in greenhouses, becoming one of the leading regions of the sector in Italy. The value added of this sector represents around 6.5% of the total value added of the region, equalling €213.7 million. Campania produces over 50% of Italy's nuts and is also the leader in the production of tomatoes, which reaches 1.5 million tonnes a year. A weak point, however, for the region's agriculture is the very reduced size of farms, equal to 3.53 hectares. Animal breeding is widespread (it was done in 70,278 farms in 2000) and the milk produced is used to process typical products, such as mozzarella. Olive trees cover over 74,604 hectares of the agricultural land and contribute by €620.6 million to the value added of agriculture, together with the production of fruit. Wine production has increased, together with the quality of the wine. The region has a dense network of road and motorways, a system of maritime connections and an airport (Naples Airport), which connect it rapidly to the rest of the Country. Campania has a series of historical problems and internal contrasts, although they are improving. The regional capital, Naples, one of the most populated and interesting cities in Italy, rich in history and natural beauty, both artistic and archaeological, still represents the centre of regional life. The port connects the region with the whole Mediterranean basin, and brings tourists to the archaeological sites, the cities of art (Naples and Caserta), to the beautiful coastal areas and to the islands. The services sector makes up for 78% of the region's gross domestic product. The GDP pro-capita of Campania is the highest among the regions of South Italy, yet it is only 66.7% of the Italian average, which highlights the steep economic gap between the North and the South of Italy. The situation of Campania's economy is considered "anomalous", as it is believed to have a large potential not properly exploited, as well as high rates of unemployment and of submerged economy. It was speculated that one factor could have been a failure of Campania to connect with the economy of the unitary Italian state, while another factor is its peripheral position too distant from the developed central areas of Europe. Sea-based activity accounts about 3.9% of the economy, that includes port movements of goods and passengers and sea transportation, as well as a siezable seaside tourism economy. There is a massive automotive industrial production, focused on high-quality models of brands Alfa Romeo, in facilities located in Pomigliano d'Arco in the Naples metropolitan area and in Cassino. There is also a significant aerospace industry. A Mars mission named ExoMars in 2016 had a major part of its technology designed in Naples. 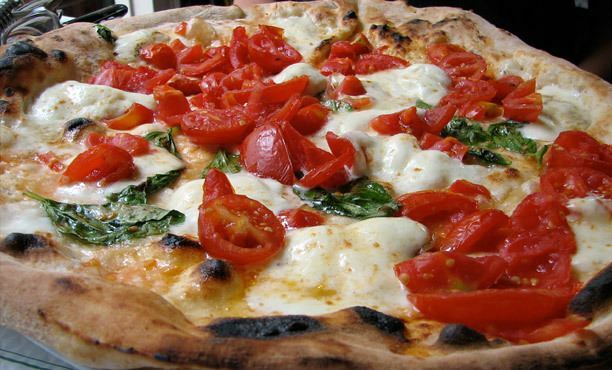 Pizza was conceived in Naples. 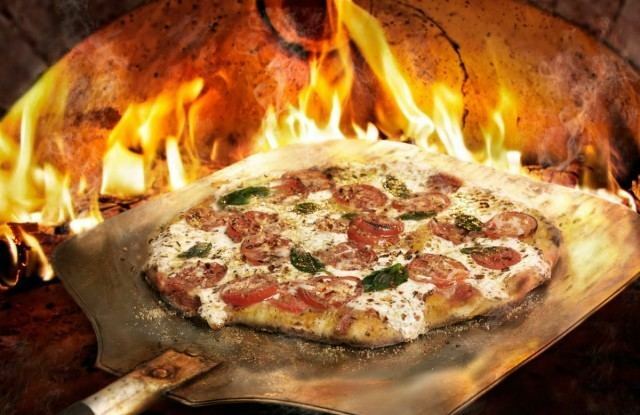 Historical and original pizzas from Naples are pizza fritta (fried pizza); calzone (literally "trouser leg"), which is pizza fritta stuffed with ricotta cheese; pizza Marinara, with just olive oil, tomato sauce and garlic; and pizza Margherita, with olive oil, tomato sauce, mozzarella cheese and basil leaves. Neapolitans were among the first Europeans to use tomatoes not only as ornamental plant, but also as food and garnish. Another Campanian dish is the so-called Russian salad (which is based on similar dishes from France), made of potatoes in mayonnaise garnished with shrimp and vegetables in vinegar. Russians call this same dish Olivier Salad, and Germans call it Italian salad. Another French-derived dish is "gattò" or "gâteau di patate" (oven-baked pie made of boiled potatoes). As with the Russian salad, Campania is home to popular seafood-based dishes, such as "insalata di mare" (seafood salad), "zuppa di polpo" (octopus soup), and "zuppa di cozze" (mussel soup). Other regional seafood dishes include "frittelle di mare" (fritters with seaweed), made with edible poseidonia algae, "triglie al cartoccio" (red mullet in the bag), and "alici marinate" (fresh anchovies in olive oil). The island of Ischia is famous for its fish dishes, as well as for cooked rabbit. Campania is also home to the lemons of Sorrento. Rapini (or Broccoli rabe), known locally as friarielli, are often used in the regional cooking. Campania also produces many nuts, especially in the area of Avellino, Salerno and Benevento. Hazelnut production is especially relevant in the province of Avellino – in Spanish, in Portuguese and in Occitan the hazelnut is respectively called avellana, avelã and avelano, after the city of Avella. That is also the case of ancient Italian avellana, which is however not in use anymore. The 20th century's best known philosopher and literate in Naples was Benedetto Croce, famous for his studies in aesthetics, ethics, logic, economy, history, politics. Famous Neapolitan artists, actors, playwrights, and showmen were Eduardo De Filippo and Peppino De Filippo, and their sister Titina De Filippo. Totò (byname of Antonio de Curtis) was one of the most important comedians in Naples in the 20th century. He is also known for the song "Malafemmena". The "Circolo Savoia" and "Canottieri Napoli" sailing clubs are among the oldest in Italy and are famous for their regattas. These are also home of the main water polo teams in the city. Many sailors from Naples and Campania participate as crew in the America's Cup sailing competition. S.S.C. Napoli playing in Serie A, and the only team in the south of Italy to have won the Serie A title.